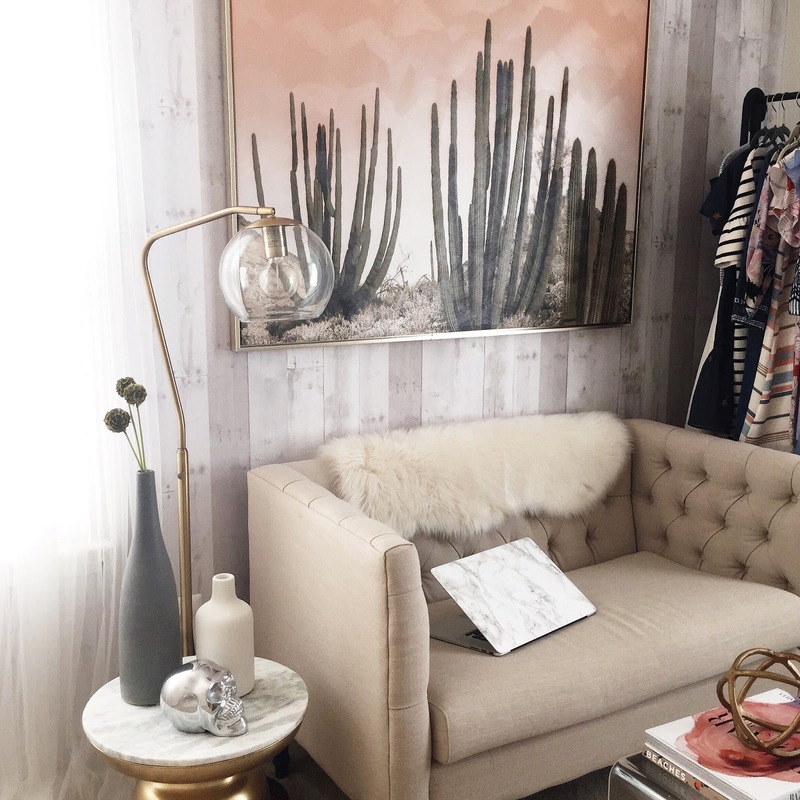 Room details: couch, cactus painting, lamp, side table, rolling rack, faux fur throw, lucite nesting tables, coffee table book here and here, metal decor piece, wallpaper, silver skull (similar) and vases (similar), laptop cover. This is a picture I shared on Instagram recently showing one side of my home office, and am loving how everything is coming together. The other side of the room will have my desk and a bookshelf and potentially a full length mirror. It feels great having one room in the house that will be my own to go work, relax and watch too many episodes of Housewives. Ha! 1. Now that a majority of my home office furniture is purchased, I am trying to find decor pieces to help spruce up the bookshelves, desk and wall. I ordered a few things like this cute docking station, marble tray and colorful lamp. I'm still deciding on whether or not I want this piece for the wall, but am so bummed I don't have the room for this rainbow mirror. How fun would that be?! And finally I may pick this trash can up for under my desk - it's adorable. 2. I know that the Cult Gaia Bamboo Ark bag is everywhere (but so worth it if you are still contemplating getting it), but they have released a few new bags that are adorable! This large bamboo tote is adorable and this bag has such a unique and quirky shape that could be fun to jazz up a plain white dress or jeans and a tee. 3. Speaking of jeans, I am already planning my after baby denim strategy. LOL There are a few pairs that have caught my eye - these black denim with the uneven hem (perfect for my short inseam), this super distressed pair by one of my favorite brands, and then these look like a great classic color and cut for every day. 4. You can never have too many classic black sweaters, and this Line & Dot one looks like a perfect piece to dress up or down. 5. Give me all the velvet everything this fall - especially these pointy-toe loafers! 6. These lipsticks just arrived at Sephora and I can't decide if I want to pick one up. What do you think? Worth trying or should I pass?! 7. Frankly, I don't even care what this skincare product actually does but the name and holographic/colorful packaging is pulling me in like a tractor beam. 8. I already love the Bum Bum Cream by Sol de Janeiro (not to mention the scent is divine! ), so this new body fragrance mist looks heavenly! And if it has the same scent as the body cream I need it yesterday. 9. I came across these leopard flats while online surfing yesterday and think they may be some of the chicest looking ones I have seen yet! And then once I looked at the leopard flats, I keep scrolling and thought these blush suede flats on sale looked amazing, as well as these scalloped silver flats that could easily work now and into fall/early winter. 10. If you love a simple, nondescript yet beautifully structured bag, this new style from Elizabeth and James is a stunner! It also comes in black leather here. 11. Oh and one last find - I just started watching Ozark on Netflix after hearing so much about it. I fell into a show hole watching The OA, 13 Reasons Why and Orange is the New Black a few months ago, but haven't found anything that has captured me since. This has done it! I'm only a few episodes in, but really enjoy it so far. I just love buying home decor items - its unbelievable how much stunning things their are.